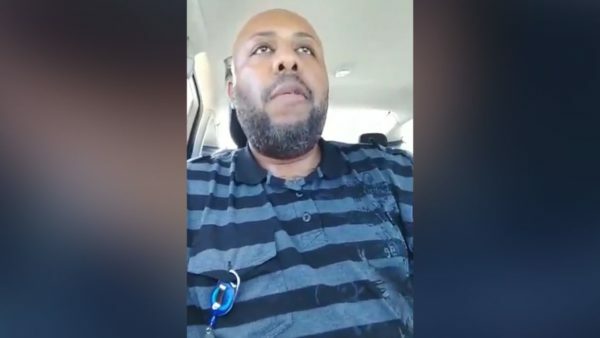 Steve Stephens, who was suspected of randomly shooting a grandfather on an Ohio street and posting video of the killing to Facebook, has taken his own life, police say. The 37-year-old man was spotted on April 18 in Erie County, Pennsylvania State Police tweeted. “After a brief pursuit, Stephens shot and killed himself,” police tweeted. Steve Stephens allegedly shot dead 74-year-old Robert Godwin as the victim walked home from Easter lunch on April 16 in Cleveland. The suspect’s mobile phone signal was last tracked on Sunday afternoon to Erie, Pennsylvania, 100 miles from where police say he shot Robert Godwin. City police chief Calvin Williams told reporters that Pennsylvania State Police received a tip-off shortly after 11:00 on April 18. Steve Stephens’ white Ford Fusion car had been spotted in the car park of a McDonald’s in the city of Erie, he said. Calvin Williams said there was a brief police chase after which the suspect’s car stopped. Steve Stephens took his own life with his gun as officers approached his vehicle, and was pronounced dead at the scene, added the police chief. Steve Stephens had been added to the FBI’s 10 Most Wanted List as the manhunt was extended from five states to nationwide. Earlier in the day, police said that authorities had received more than 400 tips, including as far away as Texas. The family of Robert Godwin – a father of 10 and grandfather of 14 – said on April 17 they forgave the suspected killer. His daughter, Tonya Godwin-Baines, had urged Steve Stephens to surrender. “Each one of us forgives the killer, the murderer,” she told Cleveland TV station WJW. “I forgive you and love you, but most importantly, God loves you. God can heal your mind and save your soul,” she said. Cleveland officials had announced a reward of up to $50,000 for information leading to the suspect’s arrest. Facebook has launched a review of its procedures after criticism that the footage stayed on the site for hours. Facebook’s vice-president of global operations, Justin Osofsky, said the first complaint made about the video showing the killing came nearly two hours after it was posted.